Brighten up these gloomy days with an intriguing craft project for you and your little one. 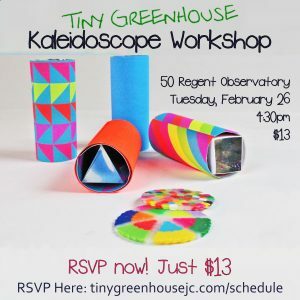 This unique KALEIDOSCOPE workshop is for curious kids and their craft loving parents, grandparents, or caretakers who are eager to create their own kaleidoscope. Our experienced teachers will guide you through the different steps resulting in a fascinating toy – science tool. We will offer plenty of fun material to make the kaleidoscope outside as intriguing as its inside. You will leave with a happy child and a self-made creation, that will keep on brightening your days.